With IVR (Interactive Voice Response), users can access communication system through phone call and perform operations according to voice navigation. The system can also play content according to the information input by users. It can reduce operational cost of enterprises and improve communication efficiency while applying SynHMP in IVR system. In all voice communication systems, IVR is always the most efficient and convenient means of service. All voice self-service systems, such as ticket center of tourist area, bill query system of credit card and background services center of operator, must provide logical, scientific and reasonable voice navigation process, efficient speech processing ability as well as perfect audio quality. 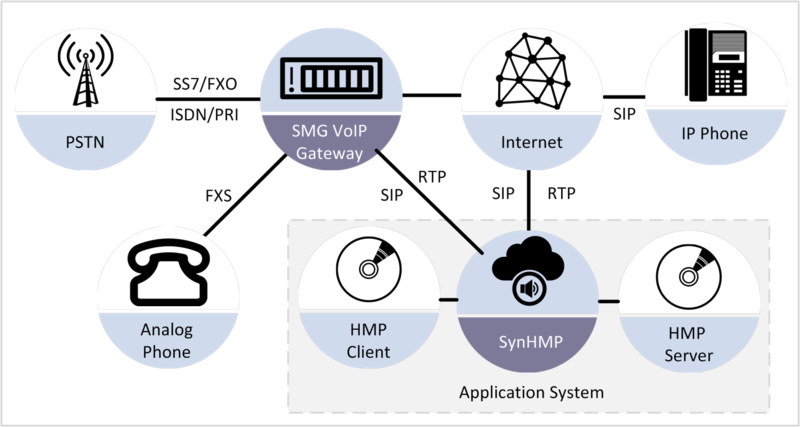 For these applications, SynHMP has obvious advantages: it is a pure software product which runs on the server with convenient installation and deployment for operational cost reduction. After initial investment in system development, customers just focus on its development and test to shorten development cycle. SynHMP can support 2400 channels of pure IVR applications. But in practical application, users may need various applications besides IVR, including fax and conferencing; it can basically achieve 1920 channels. At the same time, SynHMP can leave 50% of CPU resources to handle a wide variety of applications.